Friend to the Southern California Charity Golf Classic, Mel Austin is hosting and producing a comedy show. Mel Austin hooked us up with a great master of ceremonies for our golf tournament in July and now he’s hosting Squeaky Clean Comedy. 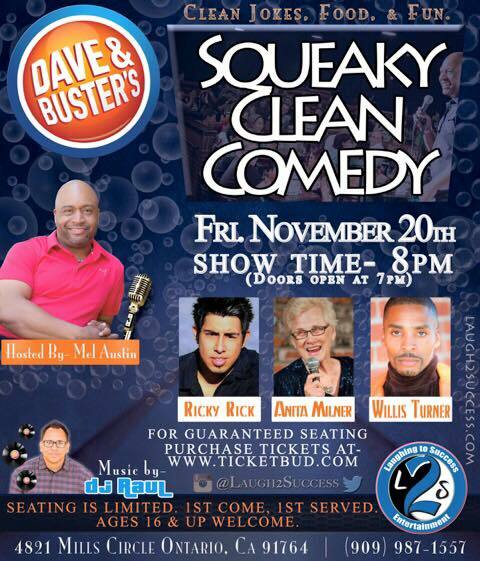 Squeaky Clean Comedy! A great way to release your stress at the end of the week. This 90 minute show is packed with high energy standup comedy without offensive language or content. Ages 16 & up welcome. Hosted and produced by Mel Austin with Laughing To Success Entertainment www.Laugh2success.com. Music by DJ Raul. If you check out the show, let us know! Posted in Southern California Charity Golf Classic.